From folding clothes piling up in the laundry basket to the ironing that awaits, laundry can sometimes feel overwhelming, especially for parents with young children! Taking time now to streamline your laundry room will set you up to spend less time actually doing laundry, while making your space safer for little ones and even get the family more involved. Laundry rooms come in all shapes and sizes, but with some organization and few important safety measures in place, the laundry room can be a less stressful place for parents and a safer place for curious children. For parents of toddlers, one way to accomplish both is to keep liquid laundry packets up and out of reach of small children. Recently, the American Cleaning Institute launched PACKETS UP®!, a nationwide campaign called to keep packets up and out of sight from children. 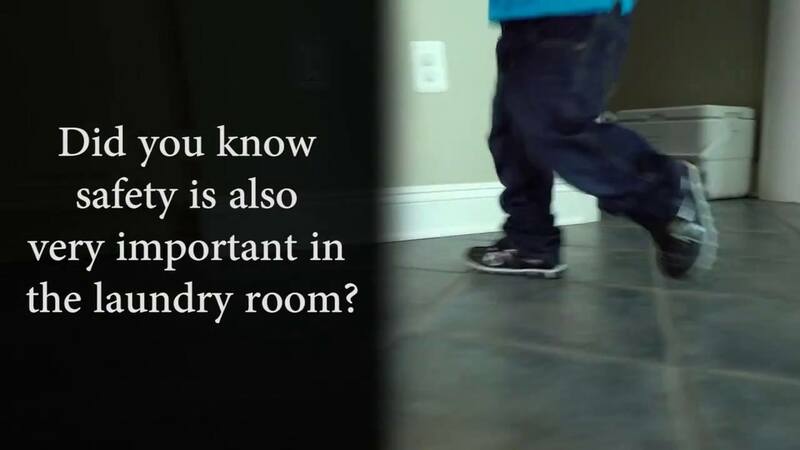 The campaign, which targets parents and caregivers, is working to encourage laundry safety and prevention in homes and recently conducted a national survey among 1,000 parents and caregivers. The laundry room can often be forgotten and filled with products, gadgets and junk. Install simple cabinet racks or shelves to hang or store products when not in use. Storage is key, especially for keeping your liquid laundry packets and other detergents in a safe place. Thinking of saving space? This year may also be a great time to consider stacked washer and dryer options. The laundry room not only has cleaning products, but also stores the washer and dryer. If your appliances have the option for child-lock, enable it for future safety. Make sure all cleaning products, including liquid laundry packets and bottles, are secured and closed in their original packaging and containers. 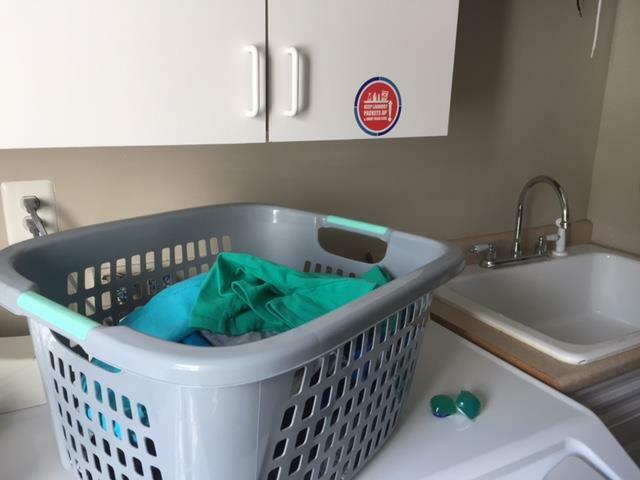 You can also order a free cling sticker to place on your appliances as a reminder to keep liquid laundry packets up and out of children’s reach. Curiosity is a powerful motivator for small children eager to explore. Put your products in closed or locked cabinets or bins that are high and stored in an upper shelf or cubby. Although we encourage parents to keep liquid laundry packets and other cleaning products out of reach from children, that doesn’t mean kids should be left out of the laundry process. Take small steps to incorporate young children into the routine. Set up bins for dark and light clothes and let them sort garments with you. Show them the safety icons on the packaging as things to NOT do. Teach your kids how to fold laundry and they will follow, too. Always read the label for proper disposal. To protect children, pets and garbage handlers, remember to rinse and re-cap the bottle before throwing away or recycling. Flush unwanted liquid detergent in an inside drain with plenty of water. 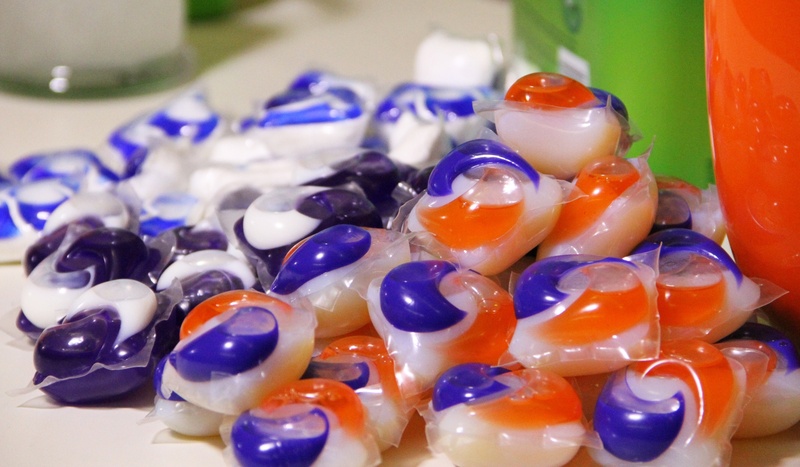 Never use empty detergent containers for storage of any other materials, especially for anything intended for digesting. Sit down and talk to your children about the potential risks of unintended exposures. Use this time as a family to set boundaries and ground rules around the house and in the laundry room. Familiarize yourself with product labels and know where the safety information is located on the containers. Know what to do before unintended exposure happens. Keep the Poison Control Center phone number (1-800-222-1222) available at all times. At the American Cleaning Institute, we are dedicated to creating better living through the safe and effective use of cleaning products. Whether it is the new year, or anytime of the year, these laundry room tips help make a difference by practicing safer laundry habits. Wishing everyone a safe, healthy and happy new year. And don’t forget to keep packets up! The post 5 Tips for a Safer, Healthier, Kid-Friendly Laundry Room appeared first on The Money Pit.